Overwhelmed by the hundreds of voters who showed up to cast an absentee ballot, Miami-Dade, Fla., election officials closed their doors to voters early today, only to re-open them about an hour later. The Miami-Dade department decided to open its doors for in-person absentee voting this morning, after the Florida Democratic Party filed a lawsuit, asking for a court order to "extend voting opportunities" before Election Day on Tuesday. In-person early voting in Florida was limited to just eight days this year, but a loophole in state law allows election supervisors to open their headquarters to accept in-person absentee ballots. 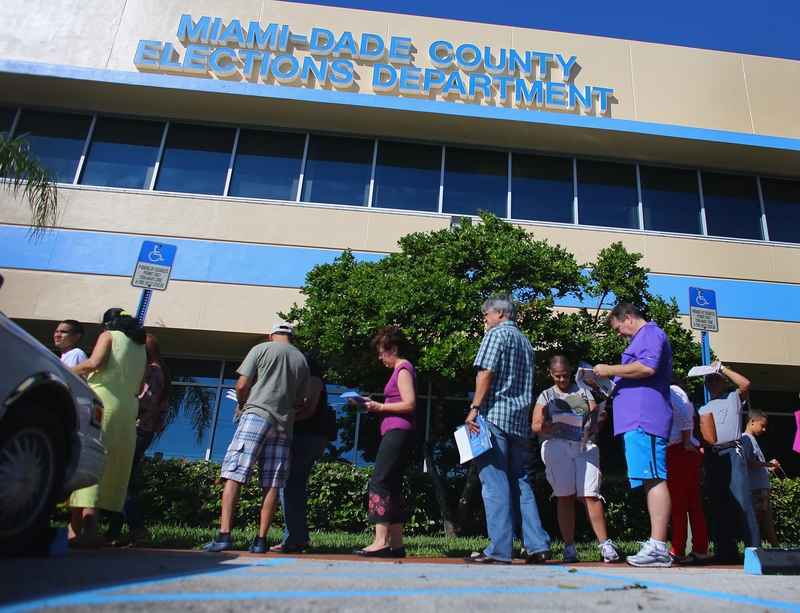 The Democrats' suit asked for extended voting opportunities in Miami-Dade, Broward and Palm Beach counties after all early voters in those counties had to wait in long lines over the weekend to cast their ballots. The Miami-Dade department responded quickly, saying it would open its doors today. Later, Palm Beach and Broward counties followed suit, according to CBS Miami, though voters in Broward must make an appointment to vote by absentee ballot today. The Miami-Dade office opened at 1 p.m. with the intent of staying open for four hours. But with only one ballot-printing machine on hand, five voting booths and two staffers, the office was quickly overwhelmed, the Miami Herald reports. With more than 180 people in line, the office closed at 2 p.m., prompting voters to start shouting, "Let us vote!" Meanwhile, voters' cars parked across the street were being towed, according to the Herald. Within an hour, however, the office was back open, and anyone in line by 5 p.m. should be permitted to cast an absentee ballot. There are 1.6 million registered Democrats in Miami-Dade, Broward and Palm Beach counties combined, accounting for about a third of all of Florida's registered Democrats, the Herald reports.